Born in West Hartford, Connecticut on October 16, 1758, Noah Webster is best known today for his magnum opus, An American Dictionary of the English Language (1828). But as David Micklethwait reveals in Noah Webster and the American Dictionary (McFarland, 2005), lexicography wasn't Webster's only great passion, and the dictionary wasn't even his best-selling book. 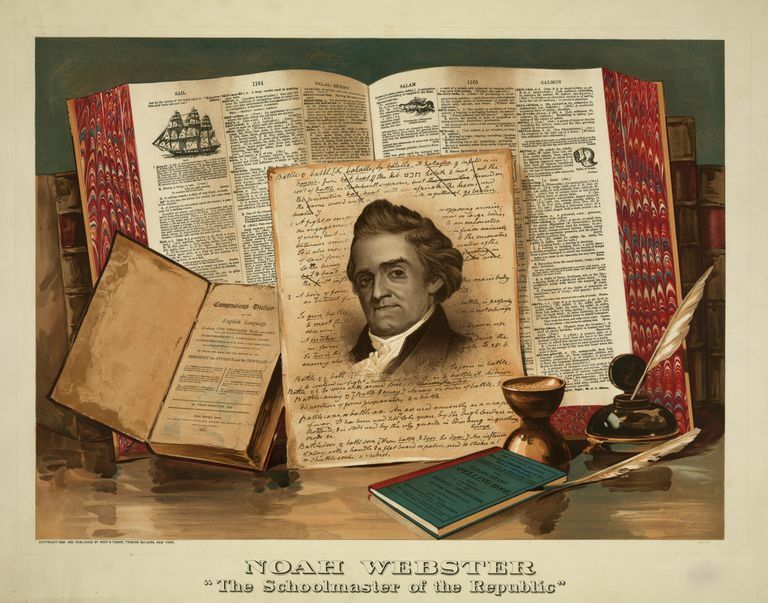 By way of introduction, here are 10 facts worth knowing about the great American lexicographer Noah Webster. During his first career as a schoolteacher at the time of the American Revolution, Webster was concerned that most of his students' textbooks came from England. So in 1783 he published his own American text, A Grammatical Institute of the English Language. The “Blue-Backed Speller,” as it was popularly known, went on to sell nearly 100 million copies over the next century. Though he fought for a strong federal government, Webster opposed plans to include a Bill of Rights in the Constitution. "Liberty is never secured with such paper declarations," he wrote, "nor lost for want of them." Even though he himself borrowed shamelessly from Thomas Dilworth's New Guide to the English Tongue (1740) and Samuel Johnson's Dictionary of the English Language (1755), Webster fought vigorously to protect his own work from plagiarists. His efforts led to the creation of the first federal copyright laws in 1790. In 1793 he founded one of New York City's first daily newspapers, American Minerva, which he edited for four years. Webster's Compendious Dictionary of the English Language (1806), a forerunner of An American Dictionary, sparked a "war of the dictionaries" with rival lexicographer Joseph Worcester. But Worcester's Comprehensive Pronouncing and Explanatory English Dictionary didn't stand a chance. Webster's work, with 5,000 words not included in British dictionaries and with definitions based on the usage of American writers, soon became the recognized authority. Although Webster is credited for introducing such distinctive American spellings as color, humor, and center (for British colour, humour, and centre), many of his innovative spellings (including masheen for machine and yung for young) failed to catch on. See Noah Webster's Plan to Reform English Spelling. In 1833 he published his own edition of the Bible, updating the vocabulary of the King James Version and cleansing it of any words that he thought might be considered "offensive, especially for females." In 1966, Webster's restored birthplace and childhood home in West Hartford was reopened as a museum, which you can visit online at the Noah Webster House & West Hartford Historical Society. After the tour, you may feel inspired to browse through the original edition of Webster's American Dictionary of the English Language.